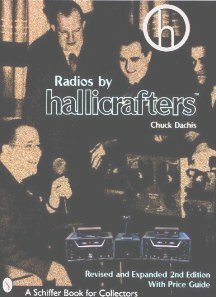 Chuck Dachis and his publisher, Schiffer Publishing Ltd. have released a revised and expanded 2nd edition of the time-honored Radios by Hallicrafters. You can buy the book now from Amazon.com! Radios by Hallicrafters is the definitive work on the Hallicrafters Co. and its products. With over 220 pages, more than 800 photographs (many in color) showing every know Hallicrafters product to date, it is 13 years in the making. It is an essential tool for the collector or anyone interested in the Hallicrafters Co. and its products.